I can’t really put my finger on Indiana. There are a few issues I had with it, such as punctuation and grammar. Not huge, mind you, but it’s there. And, I’m ambivalent about the story development. It just went on for pages and pages with nothing really happening, yet it was entirely readable. But, I realized I was on page 80-something and the actual “story” of the book had not actually happened yet. Now, I knew I was supposed to expect something in the story, so I expected there to be a build-up leading to that point, yet that’s not quite how it read. Now, that being said, I love how the story is told from the perspective of the different characters, who are very real and very likable, and relatable. And, the story is told pretty well, in that it makes you want to keep reading. I also am fascinated by the time period (the 1930s) as well as the theme of racism. This book reminds me of To Kill a Mockingbird, in that it is trying to tell an important story with huge implications without making you feel like you’re reading a book about racism, if that makes sense. Unfortunately,Mockingbird is a standard in literature that is nearly impossible to measure oneself against. 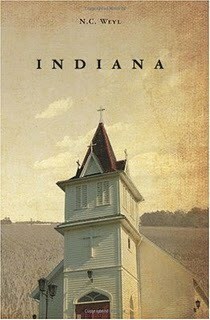 Of course, Indiana is not Mockingbird, although it does tell its story in a childlike manner, with a pure heart and an innocent view of the world. In summary, Indiana could use a little tweaking — not a major overhaul, but a little editing. But that’s the only serious complaint about this novel, which tells a compelling story in a unique way.